These days, Ozzy Osbourne is an old, mumbling idiot who prostitutes himself for the entertainment of people who watch corny shows on MTV, but back in 1968 he formed the rock band Black Sabbath with Tony Iommi, Geezer Butler and Bill Ward. 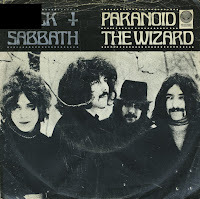 In 1970, they released the single 'Paranoid', from the album of the same name. Iommi came up with riff while the rest of the band was out to lunch. When they returned, the band recorded the track within a couple of minutes. The lyrics had not been written yet so vocalist Osbourne sang whatever came to mind. The final version contained different lyrics penned by bassist and principal lyricist Butler. The song became a big hit, reaching number 4 in the UK and number 2 in the Dutch Top 40. It subsequently landed in the annual Top 100 of all times chart from Radio Veronica, which is where I got to hear the track in the mid-Eighties.